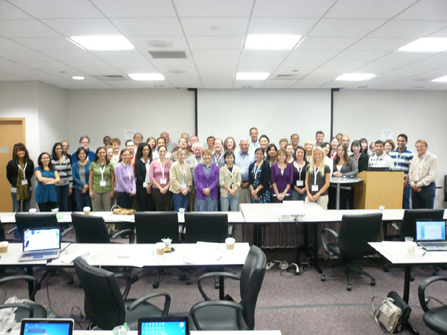 The fourth Society for Inherited Metabolic Disorders North American Metabolic Academy was held on September 11 to 17, 2011, at the William F. Bolger Center in Potomac, Maryland. The 2011 SIMD NAMA was well received by all participants. NAMA continues to set the standard as an important education nexus for inherited metabolic disorders. "I really enjoyed the algorithms and animations." "I think that this week was outstanding. All the material was informative. Because of this week, my differential for my patients has increased to think about various metabolic disorders." "Thank you for your dedication, teaching, effort, organization and kindness. You are all inspirational!" "I thought the course was excellent!" "Thank you for your generosity and effort in organizing all this for each one of us. Thank you for the spirit of collegiality, the "academic family" atmosphere and for being so approachable and patient in explaining the metabolic pathways, clinical aspects of metabolic diseased and in leading the workshops. The information and teaching accumulated in this week will serve me for years to come."